The capital of sunny and hospitable Hawaii, Honolulu attracts tourists with its world-class beaches, rich history, and night life. The mild climate of island of Oahu where Honolulu is situated is pretty dry and warm all year round. 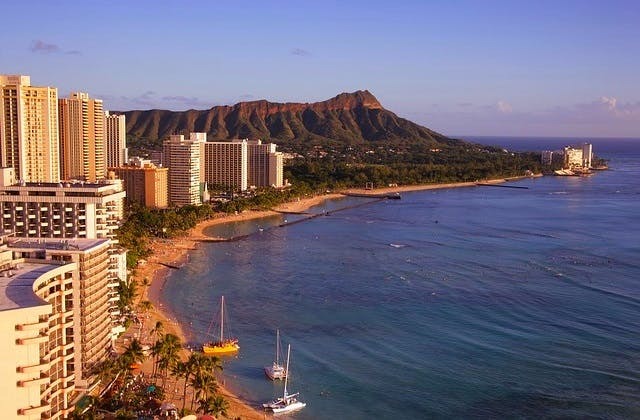 The beaches provide an opportunity for wave riding, surfing, snorkeling, and swimming, as well as just relaxing in the warm sunshine on the famous Waikiki beach. The spirit of Aloha is abundant in Honolulu with museums, festivals, and other celebrations of Hawaiian culture. At night there are a lot of bars to visit, almost all of them feature live Hawaiian music with ukulele and slack key guitars providing unique and unforgettable experience. The UTC/GMT value for Honolulu is -36000. 44 airlines fly to Honolulu. This includes Scoot, Lufthansa, Air India, Air France, Westjet, American Airlines, Alaska Airlines and more. The Airport Honolulu Hotel located at 3401 North Nimitz Highway, Honolulu is the nearest hotel to Honolulu airport.